This adapter board is designed specifically for the ESP8266 ESP-07, ESP-08 and ESP-12 2.4GHz WiFi modules. It provides an easy way to break-out the individual pins on these modules to a standard 0.1" pitch set of headers, which are also supplied with the adapter. 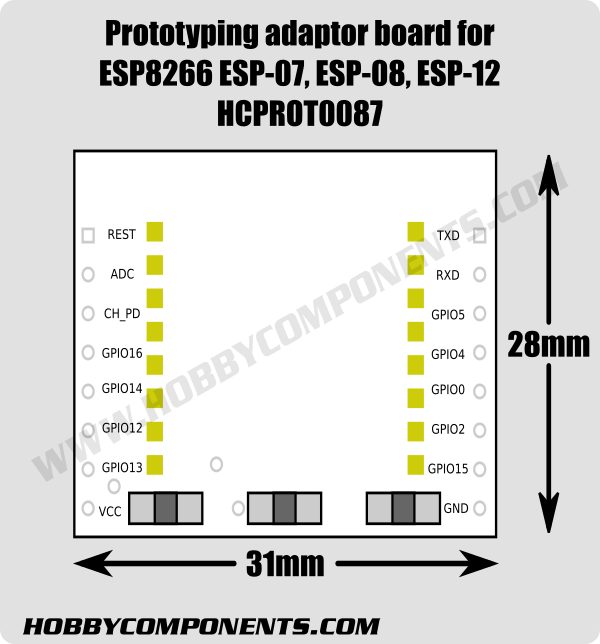 The adapter has a set of tinned pads which are perfectly positioned so that your ESP module can be soldered on to the adapter. Once soldered the adapter provides access to all the power, digital, analogue, and control pins. Additionally it also includes 2 pull-up/down resistors that pull the CH_PD/EN pin high and the GPIO15 pin low. This configures the attached module into the default operating mode.